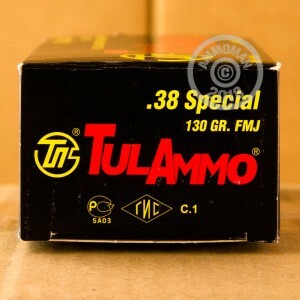 This ammunition from Tula is an excellent choice for target shooting with your revolver. Each cartridge in this case of 1,000 rounds, fires a light 130 grain bi-metal jacketed bullet at a muzzle velocity of 890 feet per second. 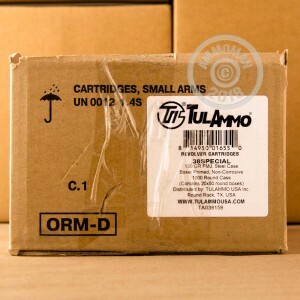 Tula ammunition is made in Russia using non-corrosive Berdan primers and non-reloadable steel cases. Its steel components may make it unsuitable for some indoor ranges, so check before ordering if unsure. Grab this case or any other items totaling $99 or more to get free shipping from AmmoMan.com! Have to force out of cylinder.This happened with all 8 of our revolvers during class. Will not purchase again. Saw the reviews that they get stuck in revolvers, thought I'd prove it myself so I bought a box of 50 38 Special & 357 Mag. All jammed in my Taurus 357 and Ruger Security Six, had to tap them out. Pay attention to reviews, we are not here to hurt products just point out issues on certain equipment. I have used 1/2 case of 1000 .223 in my AR, that works great. After shooting a full cylinder, the polymer coating of the cartridge prevented smooth extraction. Had to wait till the cyl cooled down in my S&W Airweight. In my Ruger GP100 Match Champion it fire great groups and had no problems ejecting cases. Ordering more! If your revolver likes it, then you're good to go. 3 of my GP100's and a Taurus 82 have no problems with this stuff, it's very accurate and you don't feel like you're "wasting" brass case. 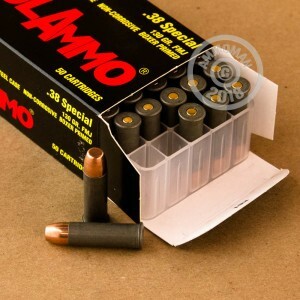 At about $30-50 less than brass case "range ammo" you can't go wrong. Also great for single actions. Bought this ammo and. 357 mag for plinking from a Taurus 617, 7 shot revolver. Brand new weapon, cleaned and lightly oiled. First seven shots of. 38 fired fine, getting the spent cartridges out of the chamber required a forced tool through the front side of the open chamber to remove them. Loaded the. 357, 7 shots fired fine, these 7 required brute force in the same manner to remove them. Not worth it.